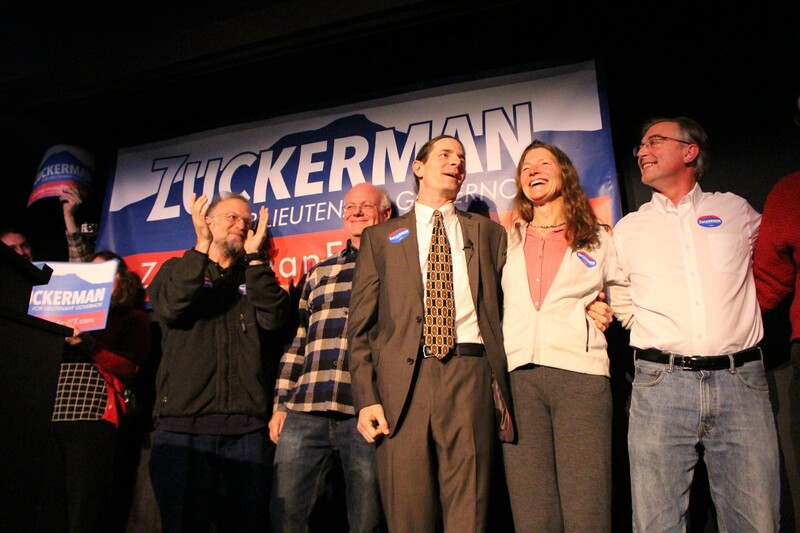 David Zuckerman (center) at his December lieutenant gubernatorial campaign kickoff. Vermont Progressives opted Saturday not to endorse any of the Democratic candidates for governor. Progressives are still regretting their support of Democrat Peter Shumlin in the gubernatorial race in 2010, when he first won the office. The Progressive Party State Committee did agree to endorse Sen. David Zuckerman (P/D-Chittenden) in his bid for lieutenant governor and to back the reelection of State Auditor Doug Hoffer, also a Progressive/Democrat. Those endorsements come as no surprise. But most of the committee voted not to support any of the three Democrats running for governor, Progressive Party chair Emma Mulvaney-Stanak said. All three — former state senators Matt Dunne and Peter Galbraith and former state transportation secretary Sue Minter — sought the left-leaning party’s endorsement at the meeting Saturday in Randolph. That was a factor, Mulvaney-Stanak said. But so was the sense that Shumlin was not aggressive enough in his support of Progressive causes such as tax reform, livable wages and universal health care after the party chose not to challenge him in 2010. “Clearly, that did not work out for us and people are still bitter,” she said. Progressives are unlikely to field their own candidate for governor this year, she said. They will reconsider whether to endorse a candidate after the August 9 primary, Mulvaney-Stanak said. Their focus meanwhile will be on legislative races and on supporting Zuckerman, a Progressive who is running against Rep. Kesha Ram (D-Burlington) in the Democratic primary. Those candidates could soon be joined by Democratic House Speaker Shap Smith (D-Morristown), who is expected to announce his plans this week. The Progressive Party State Committee also opted against endorsing candidates for secretary of state, treasurer or attorney general, Mulvaney-Stanak said. Richard Dunne, a Democratic candidate challenging incumbent Democratic Treasurer Beth Pearce, sought the Progressive endorsement, but the committee declined, Mulvaney-Stanak said.